Editor’s note: The following piece is guest post by Dalit Holzman from Natural Pod, one of our favorite eco-friendly toy companies. Dalit is part of the Natural Pod team (www.naturalpod.com) and raises her two daughters as open-endedly as possible…with the help of some boxes. We’ve all heard it. In fact we’ve all said it: “the best toy in the house is the cardboard box!” As parents we are constantly reminded that the active imaginations of children really don’t need much stimulation to get going…and going, and going, and going! Just the other day my very own living room was transformed from, well, a living room into a series of caves and burrows, an enclave for ambushing mini- pirates! Kids constantly mimic and replay the world around them, and though I am no pirate (lol), my daughters do seem to have many of my mannerisms and modes of communication down to a science (arrr me hearties!) They listen to learn to repeat. 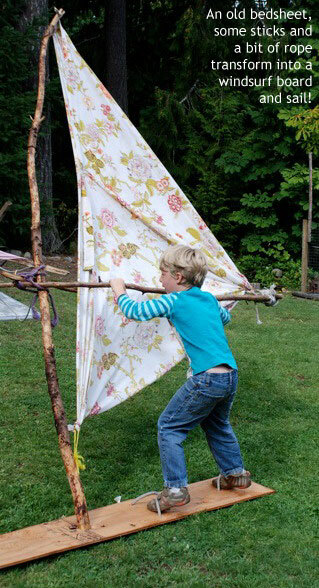 When we allow our children space for their imaginations to flourish, they do. And so, handing a kid a toy that does all the talking, all the expressing for them really can be more of a disservice than anything. A smiling doll will “always be happy”, a monster truck will “always be loud”, etc. When in the real world, let’s face it, people are so much more complex than “always happy”, and monster trucks may very well be hybrid! The thing about the old cardboard box is that it actually gets them thinking outside it (the box, that is) rather than being fixated on what pre-imagined things lays in it. And, it seems to me we’ll all agree, that there’ll never ever be too much ingenuity for humanity’s evolution and growth: environmentally, socially, holistically. When we provide surroundings that stimulate rather than bombard, invite rather than perscribe, we make space for the little big-people that our youth are yet becoming…and that, my friends, is a beautiful thing. Dalit Holzman is part of the Natural Pod team (www.naturalpod.com) and raises her two daughters as open-endedly as possible…with the help of some boxes. What a great article. I find it is so wonderful to watch kids develop their own ideas, to think outside of the box, if you will. You can visually see them learning and rising to the challenge of entertaining themselves. Thanks for the article to remind us of that. I LOVE that photo! My greatest joy as a parent is watching my kids create plots and props for imaginitive play – it never ceases to amaze me how much is going on in their heads! Thanks so much for a great article. I have been really trying to make sure all of my daughter’s activities have at least SOME educational value. This is not easy to stick to, but it can be done. I even bought her a little app for her iPod touch called Little Cook. In that game she gets to mix all sorts of ingredients into different meals that get tasted by a little feisty food critic. Still, she is learning about what food combinations go together and which ones do not. Like I said, it’s not easy, but making activities at least somewhat educational is not impossible.